Immaculate 4 bedroom beauty within walking distance to award winning schools! Nicely landscaped, tastefully painted- skylights highlight vaulted ceilings. Foyer entry, large office/parlor has picture window. Formal dining room is just off the fully equipped kitchen with slate appliances, updated counters and it&apos;s open to the bright living room that showcases a corner wood burning fireplace. Sliding doors lead to open patio overlooking a fenced backyard. The serene master bedroom has a private bath with an updated vanity and deep garden tub. Three more guest rooms are off a separate hallway and share an updated bath. Plenty of room in the 2 car automatic garage to park an SUV! 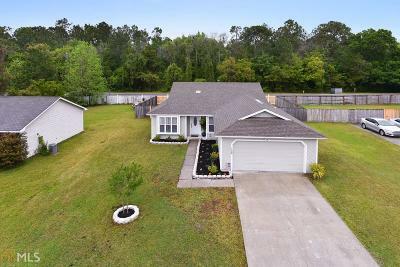 This popular neighborhood is apx 6 miles from Kings Bay, 25 min to JAX airport. Directions: Follow The Lakes Blvd. Around To Lake Jordan, Across From Matilda Harris Elem. Then Take A Left On Rising Mist Way. Home Will Be On The Left.